Marcie (in the grey shirt) said, "Woot! I would not have had such a great experience and successful time (was hoping for under 4 hours) in my first marathon without you guys and without Rich. I would seriously sign up for another marathon if I knew he was pacing a group!" Why run less when you can run more? Crossing the finish line at IRONMAN China with a stress fracture in my foot to become an IRONMAN. I want to pace because I want to help people realize the joys of running and training. 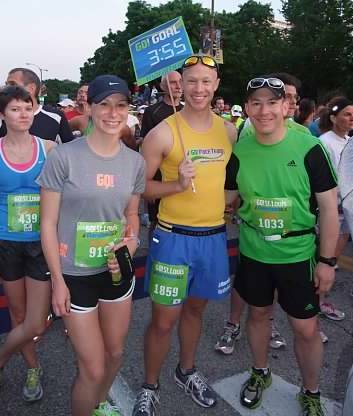 Pacing my first marathon (at Rockford) was quite the experience. I came in 17 seconds ahead of time with an exact pace of 9:44 min/mile. Someone should run with my group if they want to have a good time and enjoy what the course has to offer. Be ready to tell stories/jokes and laugh as much as 26.2 mile allows. Good luck to all participants in all races! I like to do charity bike rides as often as I can to help raise money for worthy causes. It’s always good to take something that you enjoy and put it to a better use.